The 2000 Overbrook High School Mock Trial Team I co-coached with Lisa Washington. In college, I co-coordinated the school’s volunteer tutoring program, and tutored a local minority high school student, Malik, through all 3 of my years spent on campus. (I spent my junior year studying in Spain where I became fluent in Spanish.) Malik was one of the few minorities in his school. I have always enjoyed working with kids, and boosting their confidence. As a practicing lawyer, I spent 4 years coaching high school mock trial teams. I co-coached the inner-city, all-minority 2000 and 2001 Overbrook High School Teams in a national mock trial competition with my friend and colleague from Blank Rome (the prestigious large law firm where we both worked at the time), Lisa Washington. 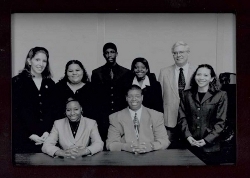 The photograph on the left is of the 2000 Overbrook High School Mock Trial Team. I appear on the far left. Lisa is on the far right. The students’ teacher, Phillip Beauchemin, is standing behind Lisa. Coaching was quite an effort. It meant spending late nights at the office to get my work done, but it was worth it. It was an incredibly rewarding experience. Shy students who feared expressing their opinions came out of their shells. They gained confidence and composure. After putting on mock trials, voicing their opinions became easy. The students did amazingly well in the competition. They kept winning and with each win, the competition got tougher and the practices longer and more sophisticated, as we delved into issues at increasingly higher levels. The students’ hard work paid off. In stunning fashion, the 2001 Overbrook team beat St. Joseph’s Prep to advance to the state semifinals. The 2000 team before it had done well, too, beating over 65 public and parochial schools to make it to the Regional Championships. Everything about the mock trial practices required teamwork. Each student lawyer had to work with a student witness, as the strength of their presentations were interdependent. Everyone had to pull together to make the team succeed. In the process, the students bonded. Many keep in touch to this day. One of the students graduated from Temple Law School and coached an Overbrook High School mock trial team to victory in the Regional Championships. My fondest memory from the Law School was watching that happen there. While I was at Blank Rome, I also worked with younger children. In 2001, I spearheaded bringing Philadelphia Reads to the office. The program provides educational support for poor, inner-city school kids. The goal of the program, which at the time was run under the auspices of Mayor Street, remains the same today: to ensure children read well and independently by the end of the third grade. Teaching youngsters to read was a joy, and the program had an added benefit. It brought lawyers and staff together. We taught in groups of three so there would always be someone there for each child. One of the students I coached on the Overbrook High School Mock Trial Team majored in Communications in college and became a nurse. In December, 2011, we spoke to students at Edison High School, an inner city school with a high concentration of at-risk students. In the interactive discussion, we spoke about the Mock Trial program and the importance of completing high school and going on to college. In February, 2012, I spoke at the Black Law Students Association Alumni Student Diversity Outreach Reception about the Temple Law Alumni Association’s diversity initiatives. It had been announced earlier in the meeting that there were not enough attorneys for all the BLSA students who wanted mentors. After discussing TLAA’s diversity initiatives, I offered to be a mentor. I mentor to this day a wonderful young woman who took me up on my offer. I told all the students I hope they will consider joining TLAA upon graduation, and getting from it the fantastic networking opportunities it presents. TLAA, I am proud to report, was a major event sponsor of the BLSA Diversity Outreach Reception. In June of 2012, I spoke on a panel addressing the subject of leadership with Springdale middle school girls. My fellow panelists were La-Toya Hackney (Assistant General Counsel of Sunoco), Maisha Leek (Chief of Staff of Congressman Chaka Fattah), and Nina Ahmad, PhD (Chairperson of the Mayor’s Commission on Asian American Affairs and Executive Vice President/Government Affairs at JNA Capital, Inc.). Fran Fattah (Deputy General Counsel for the Chester Upland School District) moderated the discussion.